Another fine job, with a great crew of workers!! Hello Vance, just a quick line to say thank for a job well done on my kitchen tiles. Bravo to Tim and Rob and Scott for their great work. They did a very professional job, were warm and friendly and left no mess behind. Overall a great job which I love and I will have no problem at all calling on your services for my next project and certainly would not hesitate raising your company name to friends and family who may have jobs they want doing. Thank you again and all the very best to you and your team for a great 2014! It was a pleasure doing business with you. Thanks to Rob and Ron and to you , Vance, for good service, workmanship and reliability. We're very pleased! Thanks again to you and your staff for once again helping us get another project completed. 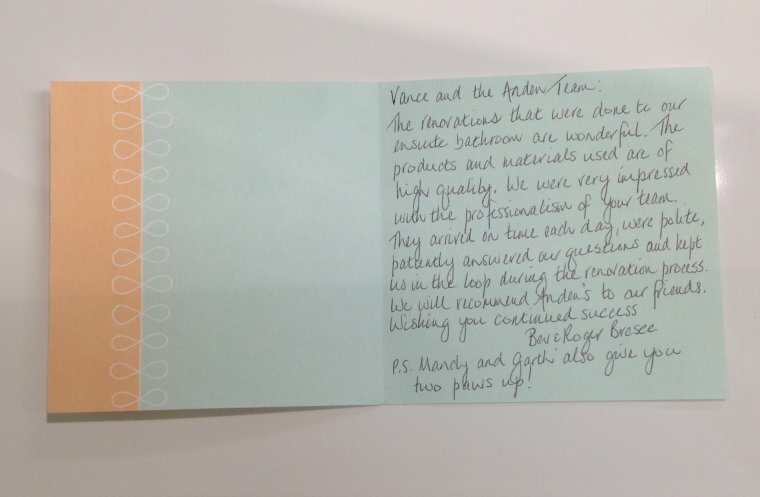 We greatly appreciate all of your efforts to make sure we were completely satisfied. 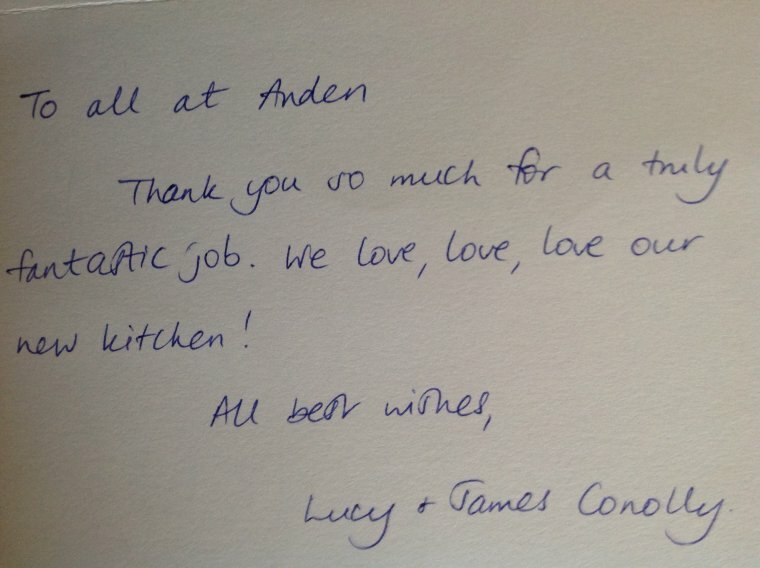 Once again it has been a pleasure to have the Anden team work in our home. Please pass along our sincere gratitude to Barry, Adam, Ted and Scott. After watching my TV debut, I felt that I had to thank you once again for transforming my very dated bathroom into a very up-to-the-minute pleasurable retreat. The two TV segments were fun to do and were the icing on the cake. From my first contact with Anden, I felt that I was dealing with a group of professional people dedicated to their work. You and Jennifer guided me through the process of choosing all the various fixtures, tiles and accessories very competently and thoroughly--I never knew that there were so many different shades of grout! Jennifer and I had fun picking out colours and she was as enthusiastic about the wallpaper choices as I was. Scott was such a great foreman, always there to guide the other workers if there was a problem, and always there to reassure me that it would all turn out perfectly. Ian, Tim and the other workers were exactly what installers should be--always on time, skilled, personable, and always communicating and reassuring me. I miss them all, especially Tim with the tales of his dogs! I have never dealt with a group of people who were more punctual which is a real plus when one doesn't have to sit waiting and wondering if the workmen are ever going to arrive. They were tidy and cleaned up at the end of every day. I didn't think that I would be getting new drains in the bathroom, but when I saw the condition of the old drains I was so pleased that everything would be replaced. I hope you are as pleased with the results of the renovation as I am. It was a collaboration--your expertise and products and my ideas and choice of things like wallpaper and tiles. The finished product is exactly what I hoped for. I love the beautiful lever tap controls; they are so easy to handle. Incidentally, you might recommend this type of tap to your older clients who have arthritic hands--the taps take no effort whatsoever to turn on and off. Thank you and your staff for a great job!! We just wanted you to know how pleased we are with our new bathroom that Anden Bath Centre has just renovated for us! The day I walked into your showroom I was impressed with the many choices both on display and that could be ordered. Reva, your interior designer, was so knowledgeable that I knew I’d be in safe hands when it came to picking out a vanity, flooring, tiles, accessories, etc. I was hooked! When you came to our house to see our bathroom and talk to us about what we wanted done, you had some great suggestions, such as how to keep it in character with the rest of our older house. In fact, your suggestion about how to frame the window has turned out to be my favourite part of the room. Your knowledge and experience with bathroom (and other) renovations gave me confidence that choosing Anden was the right thing to do. You came back another day with Scott, who was to be the supervisor, to make sure he knew exactly what we wanted. We were told there would be various people working on this project, who were all experienced in their trade. Again, we were reassured by this which is so much better than having one person who knew just a little about some aspects such as plumbing and electrical work. I had a good feeling that not only the materials we were getting through Anden were good quality, but also the workmanship would be good. I was not wrong. 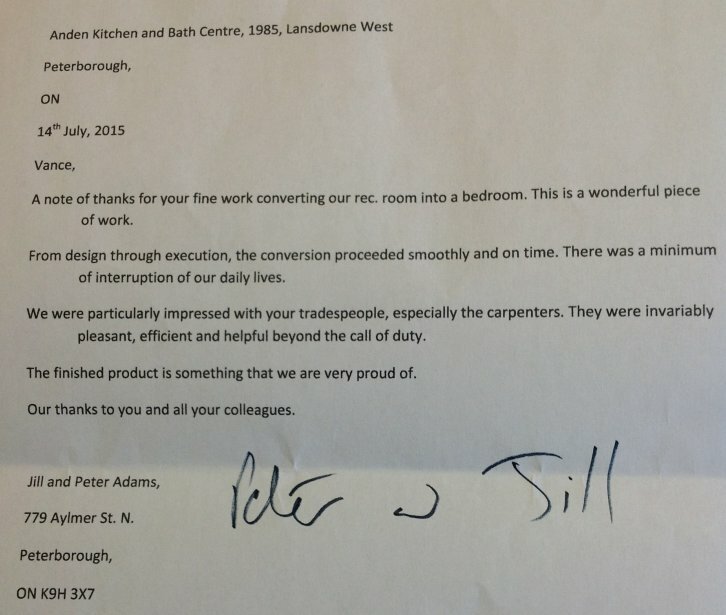 Your workmen not only strove to “do it right” as Mike Holmes would say, but went above and beyond. Scott calmly smoothed out any little problems and picked out the perfect door for the bathroom. I felt I could trust him completely and it was great to know that he was there for us and that we could get in touch with him whenever we felt we needed to. The plumber did extra bracing for the venting pipes so they wouldn’t move, put in new pipes under the floor and made sure there weren’t any clogs in the rest. Kudos to the thin young man that worked for the plumber and who somehow got his shoulders through the limited entry to our attic! The electrician neatly moved the electrical box and wires to a new location without having to go into our attic and gave us a great switch with a dimmer. Tim did a very neat job with the tiles, grouting and calking around the bathtub and was very pleasant to chat with. Ian, a man of many talents, did a super job, especially on the walls - the paint job was amazing - he has a very steady hand! He was so polite and personable to! Ron is just a genius! His workmanship was excellent, he had great ideas about where to place things (like hooks) and was superb at problem solving. All of the workmen were constantly polite, cleaned up well after each day and were very patient with our many questions. They stove their best to make us happy and they did! We have already highly recommended you to a few people that we know who need work done in their homes. 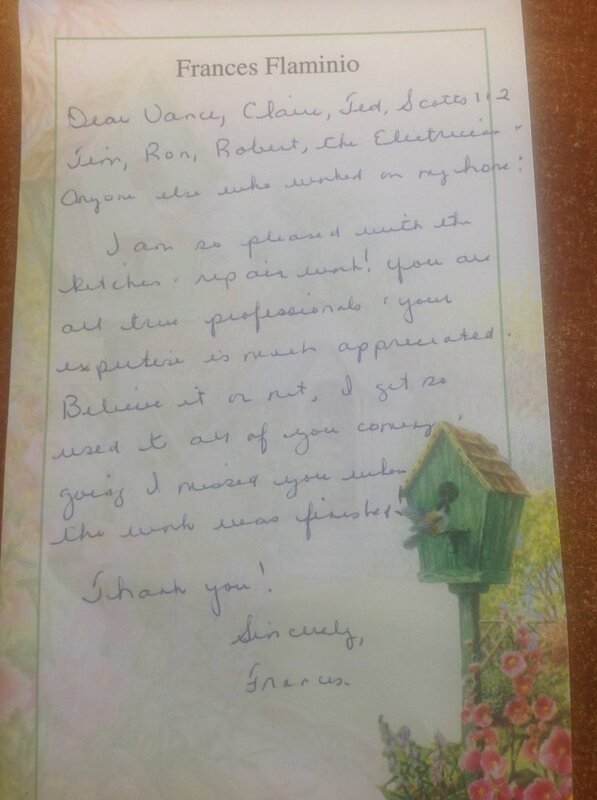 Feel free to share this letter with anyone considering having Anden do work for them. 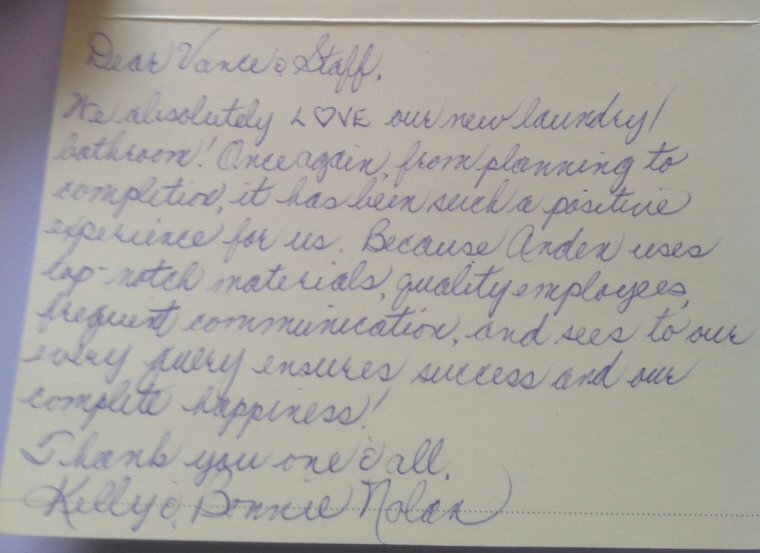 You provide quality service and we are so glad that we hired you! LOVING THE BASEMENT!!! We are not all furnished yet but starting to reorganize. We have had to close all but 1 vent as it was so hot down there I couldn't work in the kitchen. Great insulation! All the warm air was coming up the stairs. But it is a beautiful space Vance and I will send you some pictures shortly. I now know I would have changed just some minor things but hind-sight is 20/20 and I have no regrets. Thank you for looking after this for us. You really are good at what you do - not just organizing - but all the PR that goes with it - the day to day communication is key and you really handle it well. Thank you for all the 'hand-holding' and talking me down off the cliff a few times. Scott and I are really pleased with the end result. I told Barry it was a pleasure working with him and I meant it. He was my day-to-day guy and he was the best and did some beautiful work. All the others - Roger & Benny - equally enjoyable to work with. Everyone was friendly and as much as a perfectionist as I am! Thanks so much Vance. It has been a pleasure working with you and I think you can count on hearing from me again in 2015. I’ll begin by saying that we are very pleased with our new kitchen and renovated fireplace. The quality of your workmanship and service is second to none!